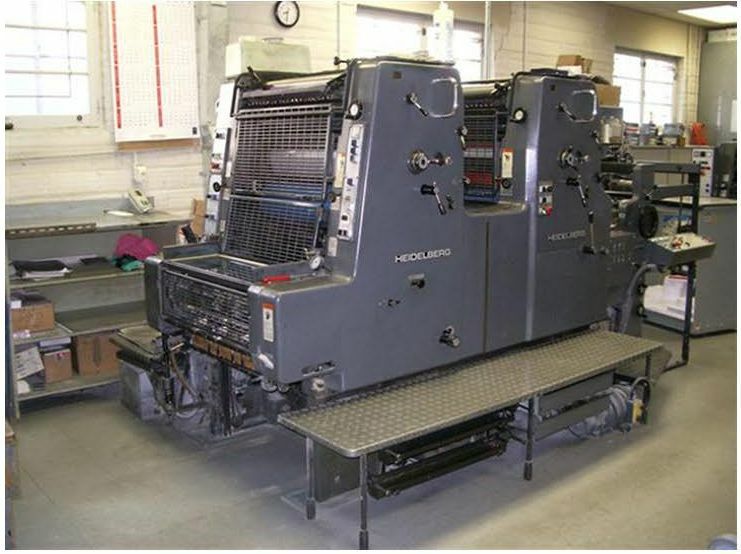 WE HAVE MORE THAN 3000 PRINTING EQUIPMENT LISTINGS. SO IF YOU DON'T FIND WHAT YOU WANT IN THESE 50 BEST BUYS, PLEASE GIVE US A CALL. 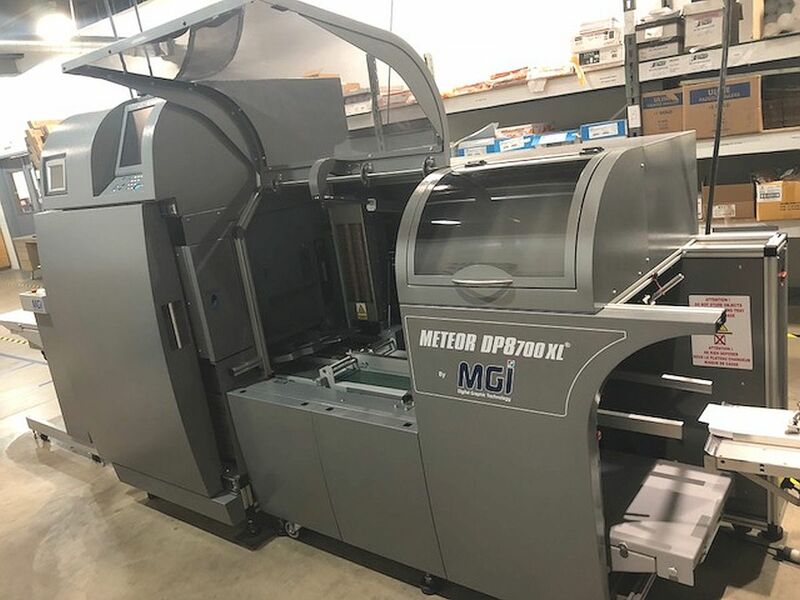 2013 MGI 4-color Meteor DP8700 XL [#89343] [image] $Call. 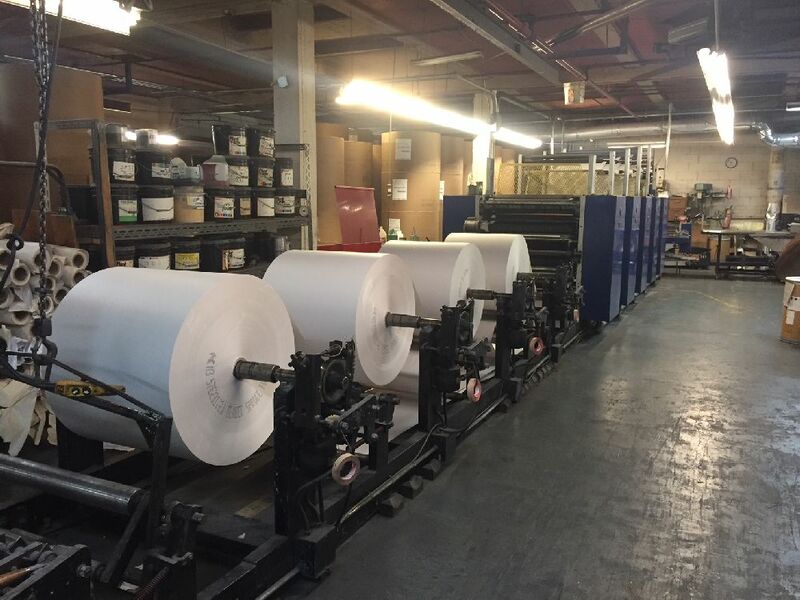 Can print synthetic paper. Includes envelope feeder. Alcolor, twin refrigeration and recirculation tanks, Midlan IR dryer, continuous feed. 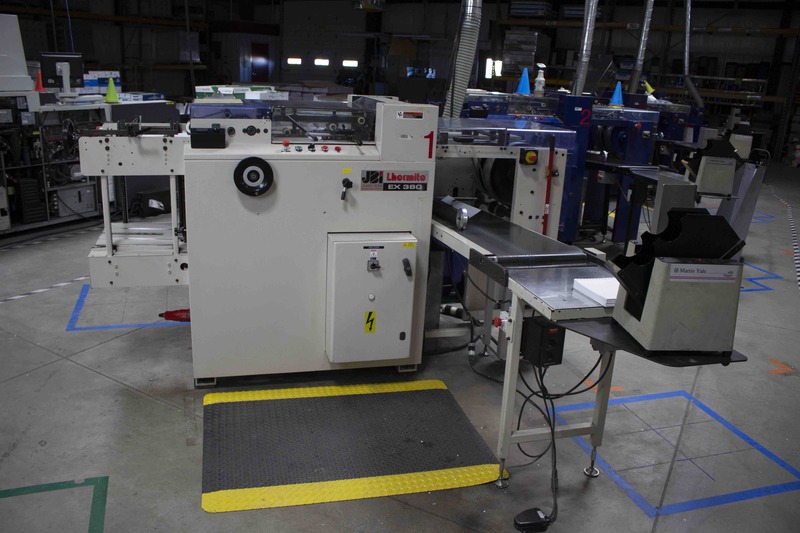 Semi autoplate changers, Varispeed damps (Delta-Effect), perfects 1 over 6, has 2 coaters, 8 foot extended delivery. 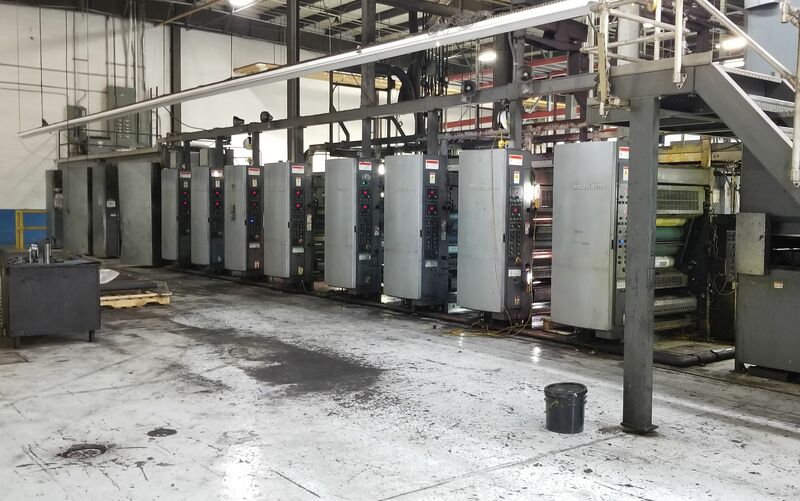 Diamond continuous damps, powder spray, Royse IR dryer, four metal jackets. Geared for numbering. No perfector. 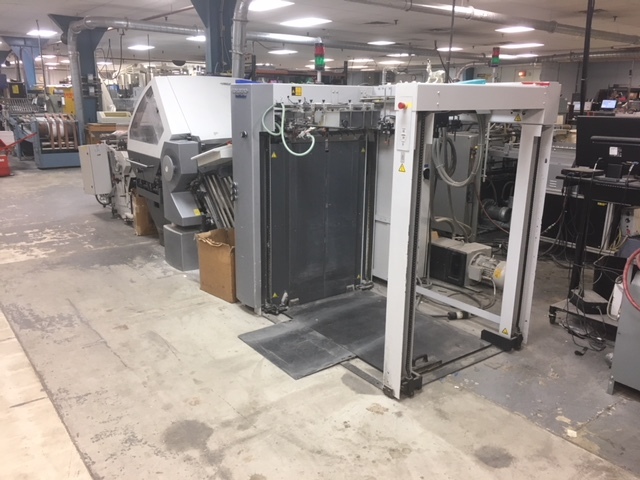 Semi autoplate, Komorimatic damps with Delta effect, PQC console, inline tower Harris and Bruno coater, extended delivery, perfector. 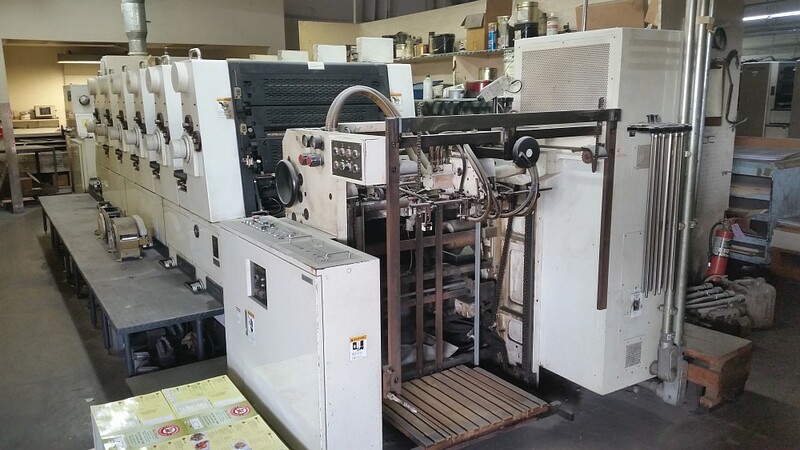 Coater, Akiyama damps?, Royse recirculation, IR dryer and air knives, continuous feed. 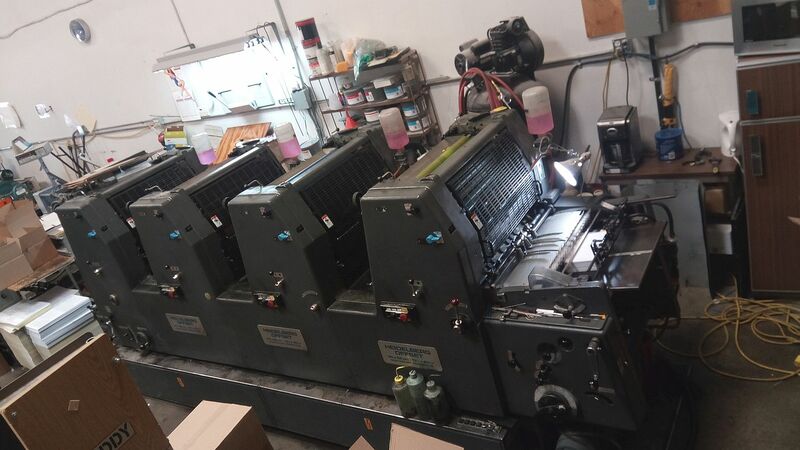 Kompac II damps with bottles, 2 over 2 perfector, super blue. 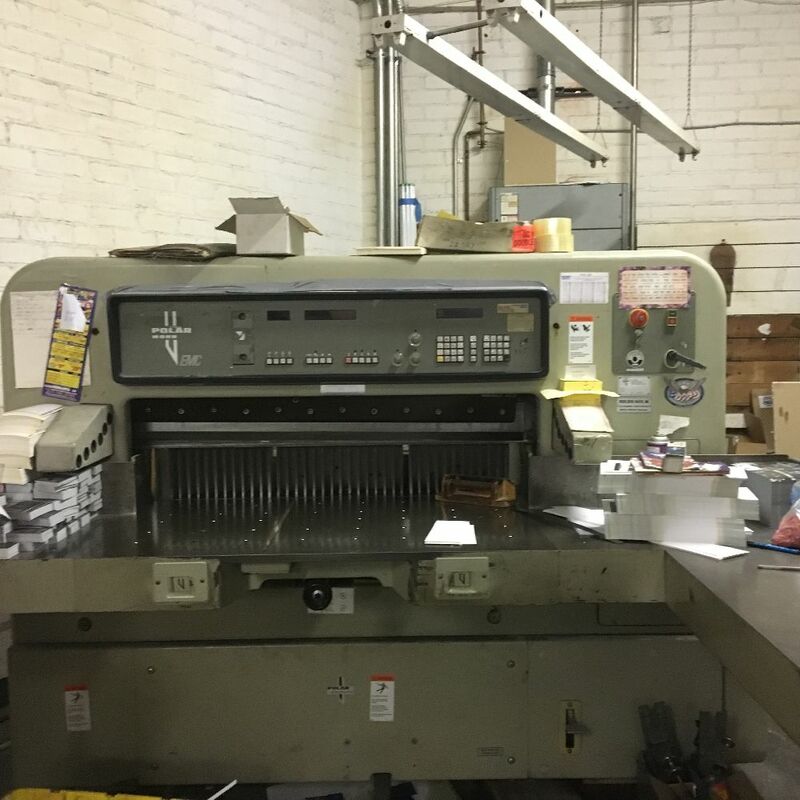 Semi autoplate, Techkon color scanner closed loop system. Perfects 4 over 4 and 7 over 1 rebuilt in 2008. 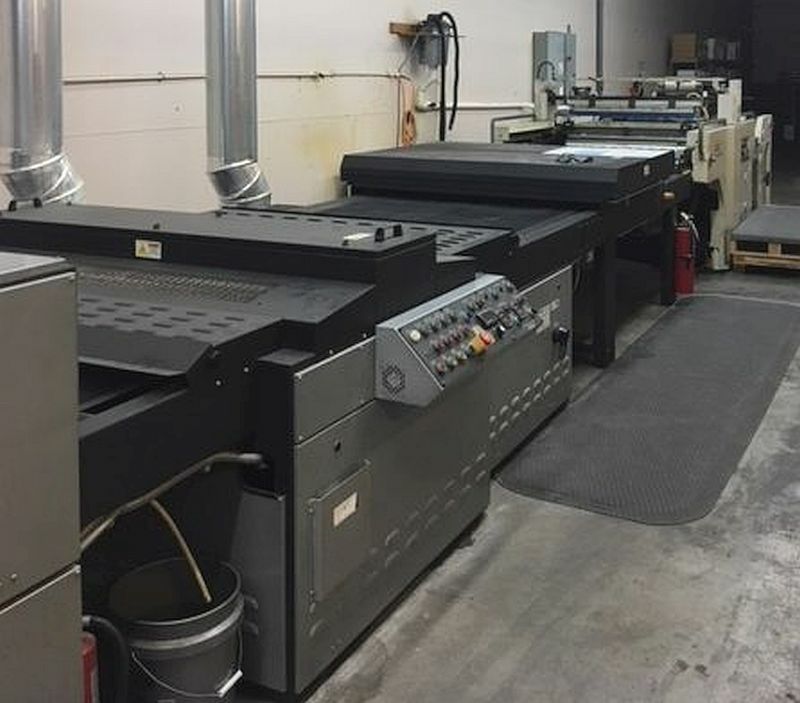 Semi autoplate, Alcolor damps, CPC1.04 console, blanket coater, chilled oscillating rollers. Condition - Needs work. Alcolor damps, 2 over 2 perfector. Video link available. 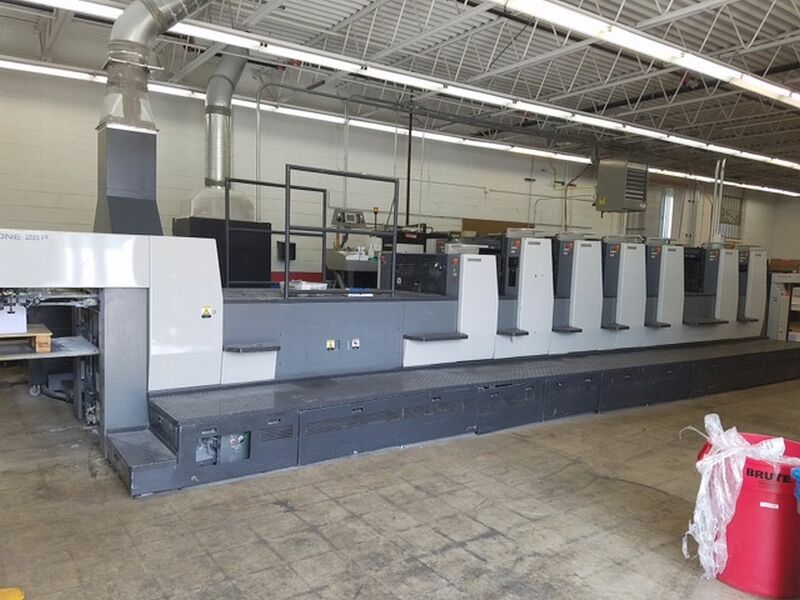 Mitsubishi Delta damps, Comrac console, coater with extended delivery. Straight press, no perfector. 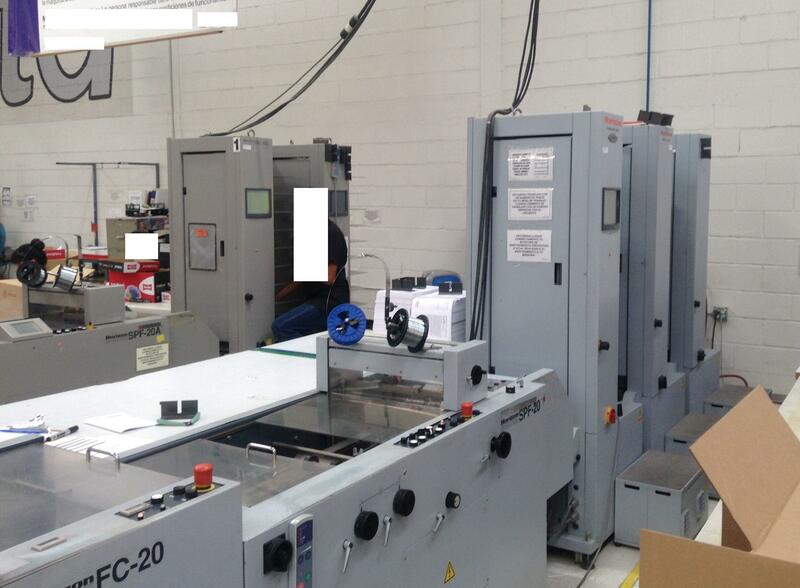 Autoplate, Alcolor damps, Aqueous coater, CPC2000 console with scanning ink measurement, perfects 3 over 2. Alcolor damps, 2 over 3 perfector, CPTronics, CPC1.03 console, standard delivery, Grafix IR dryer, Baldwin refrigeration and recirculation. 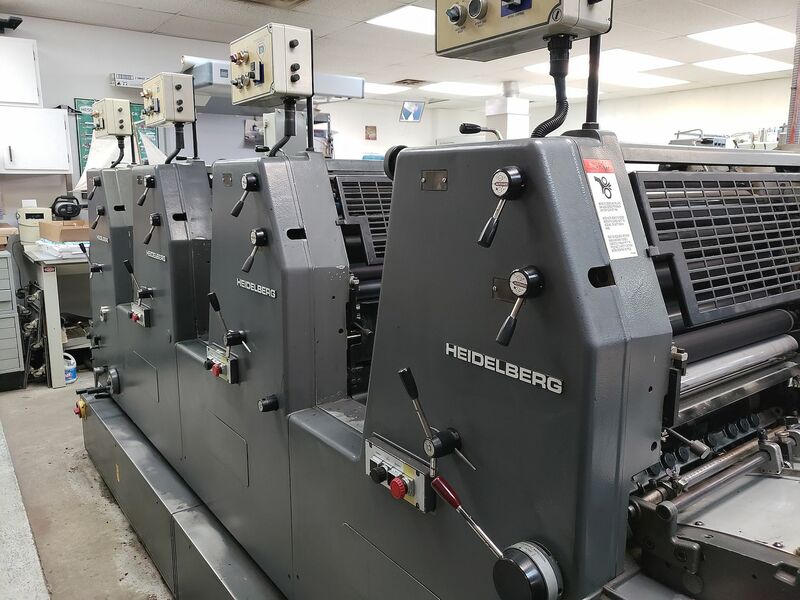 2002 Heidelberg 8-unit M130 [#89771] [image] $Call. Heatset, double web, remote control ink and register two webs. 2 folders with Delta Fold, double parallel and quarter, double former. Two DGM 4-highs, two motors and drives. Motorized running circumference on all units top and bottom controlled from the units. Harris JF10 folder with quarter fold and DP. Manual ink fountain keys. 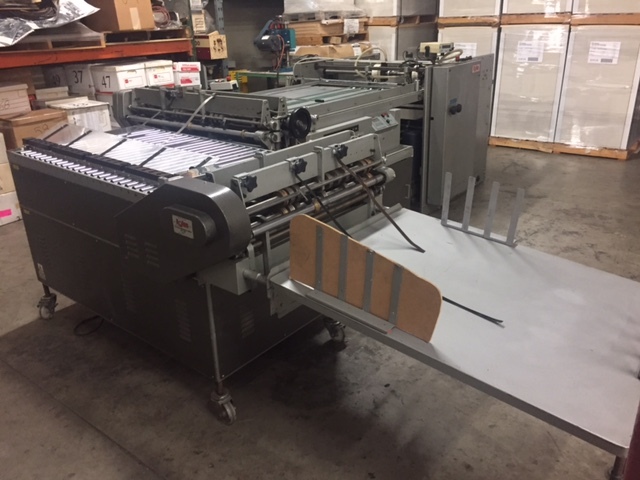 Running circ register from 2008 on 3 units one side, greaser, double former folder with quarter fold, 4 roll stands. 2005-2006 MBO B30? Automatik [#89706] [image] $Call. 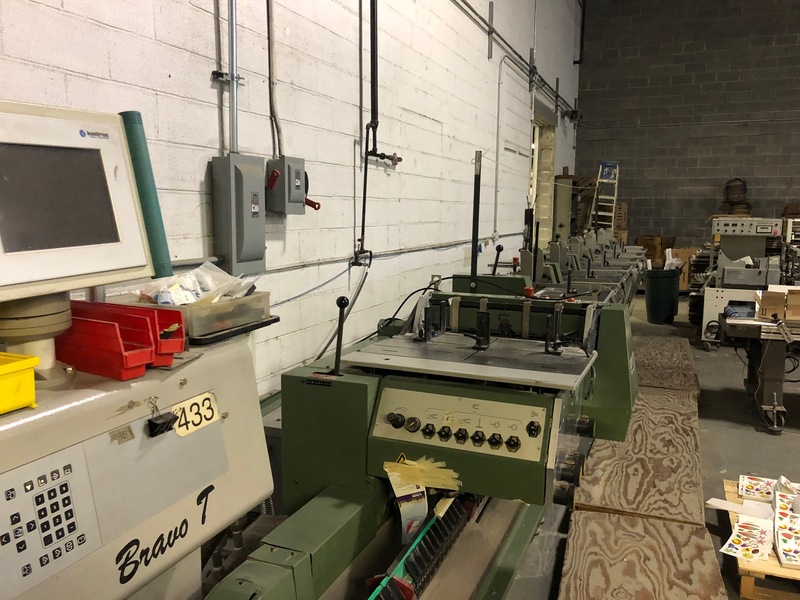 Fully automatic, Vaculift pallet feeder, 6/4/4, two right angles, presser stacker. 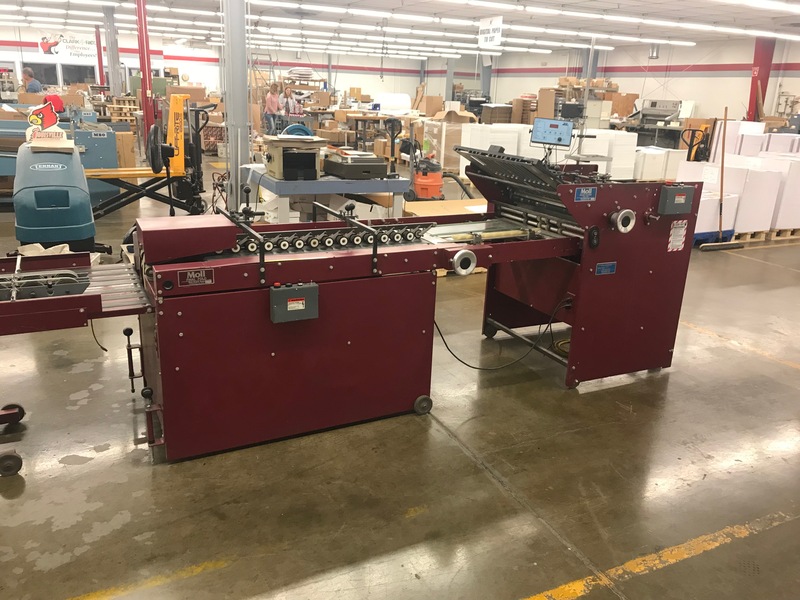 Pocket folder gluer, Dial-a-Feed suction air pile feeder, Final-Fold, delivery conveyor, Valco cold glue pressure system. 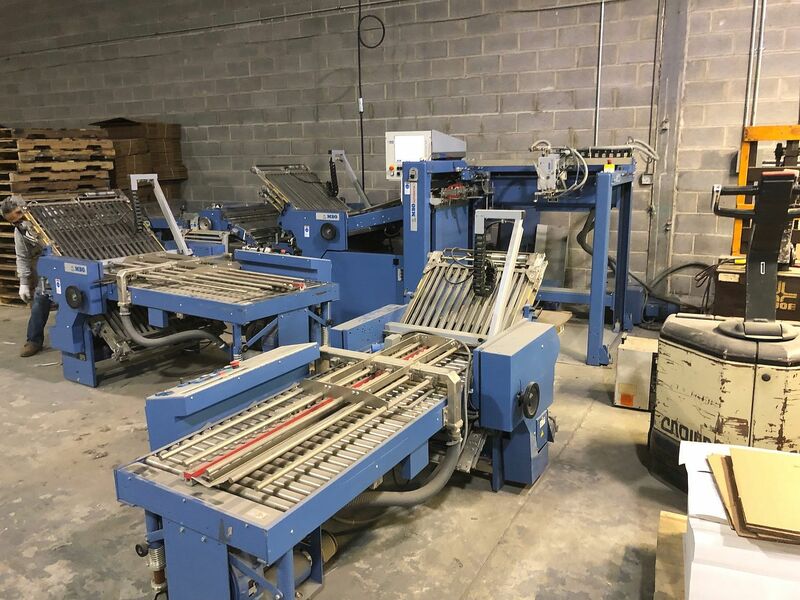 Three air suction collator towers (two 2001 VAC-100m towers and one 2008 VAC-100a tower), 2008 SPF-20 Stitcher & Folder, 2008 FC-20 Fore-Edge Trimmer, 2002 ST-60 stacker. 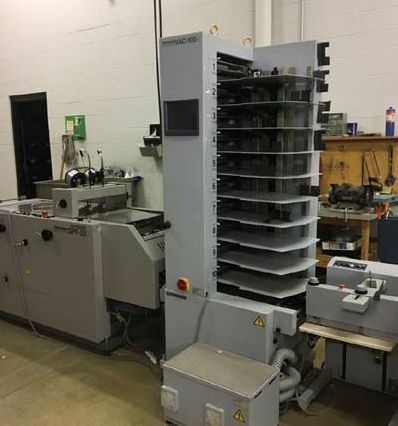 10 bin collator tower, SPF-20 Stitcher and Folder, stacker. 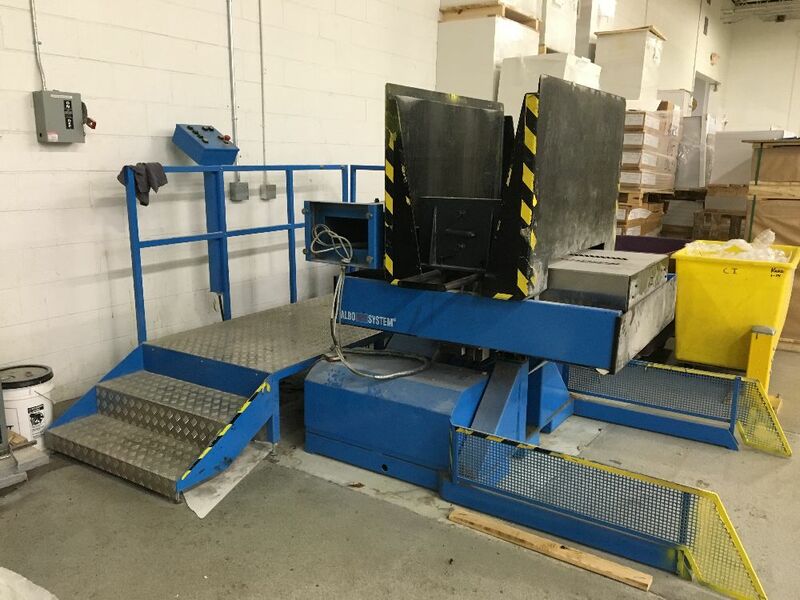 6 pockets with Optiscan Signature Recognition, 4th and 5th knives, cover feeder, delivers to conveyor. 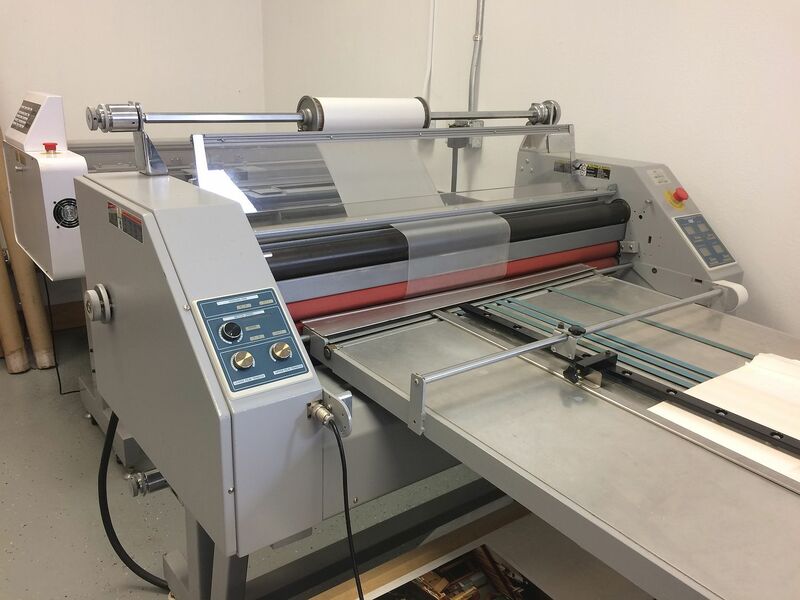 2-sided laminator, preheaters, cooling fans, integrated GBC digital feeder, and GBC digital trimmer. 2 chases, feeder and delivery same side, double loader. No inker. 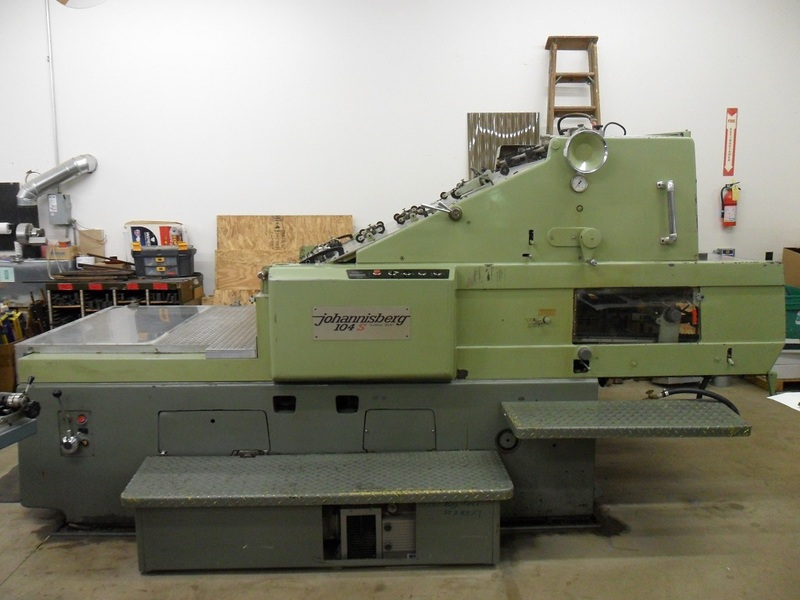 Double shaft die scoring system with right angle and skip perforation. 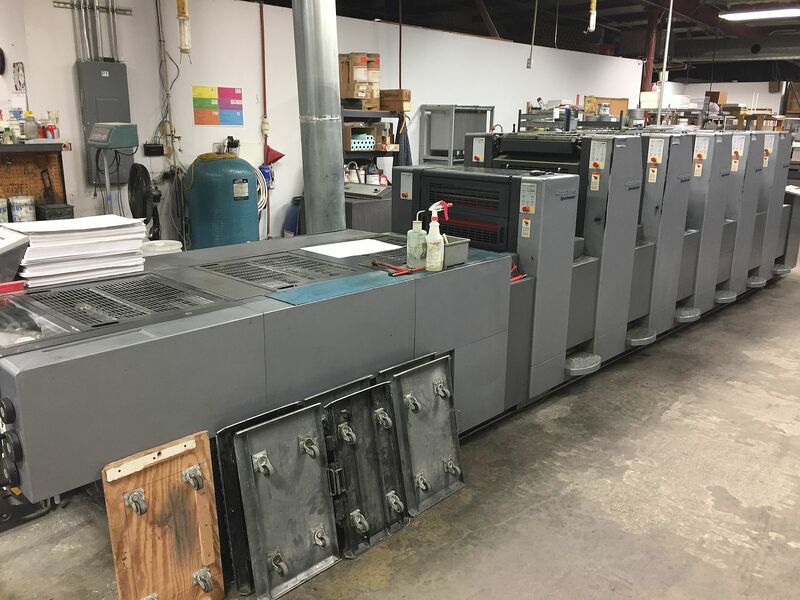 1997 Albo System PT-1000AP [#88216] [image] $Offers considered. Skid turner, above ground type. 55 inch max pile height. Has aeration. NEEDS electrical work - offers considered. 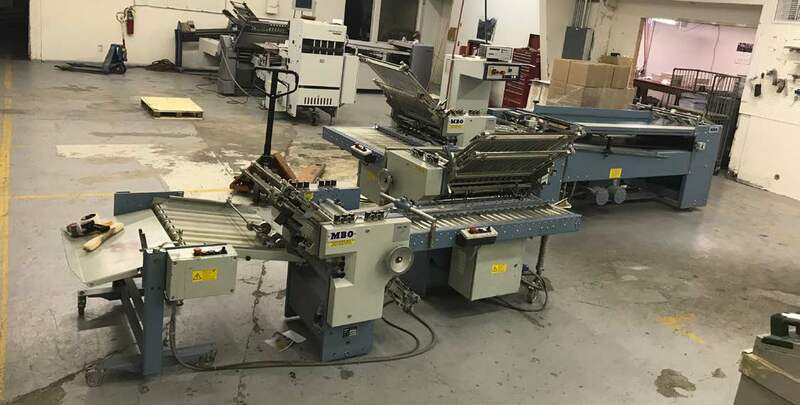 Folder with pallet feeder, 4 buckle plates and 2 cross fold knife units, and 2006 VSA-66 stacker delivery. 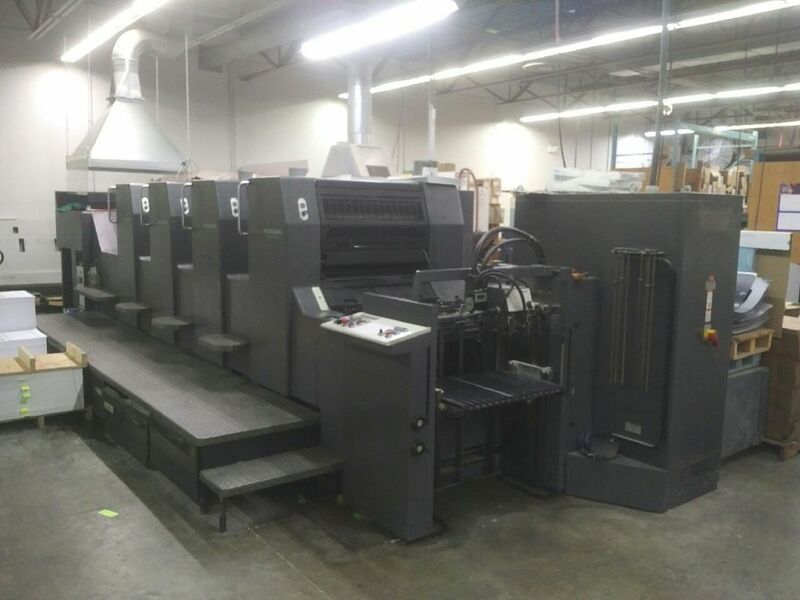 2001 MBO B26-C [#89401] [image] $Call. 2011 Stahl TI-36 [#89513] [image] $Call. 6/6, mini fold, small piece stacker-(older). Also has a conveyor delivery. Waiting on photos to come! 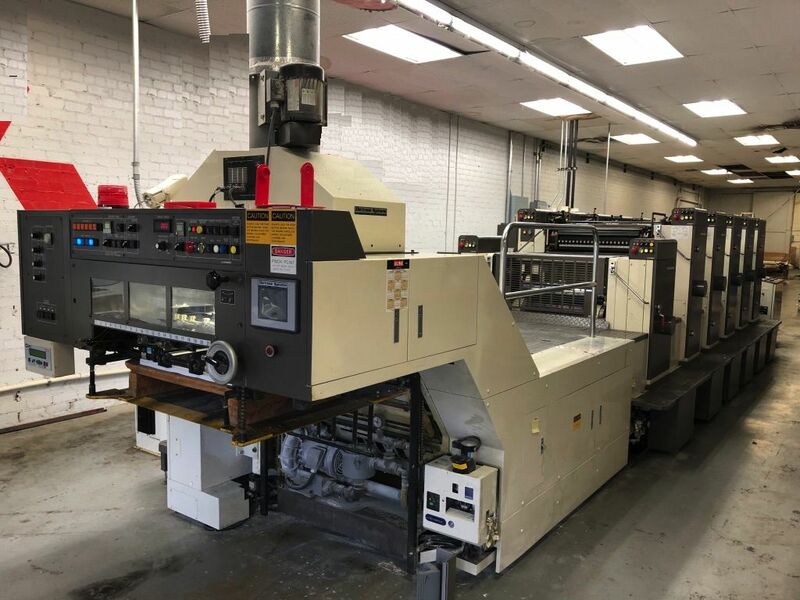 2008 Sakurai SC102A2 [#89519] [image] $Call. 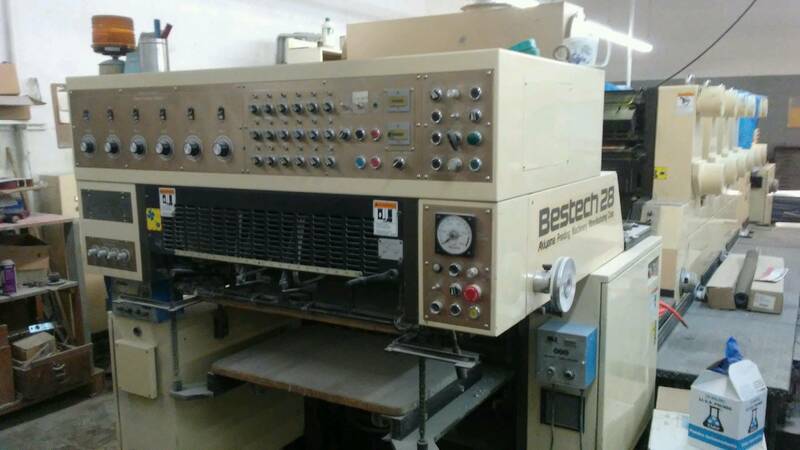 Olec IR dryer and 2 lamp UV dryer with AC cooling. Olec DS descending pile stacker. 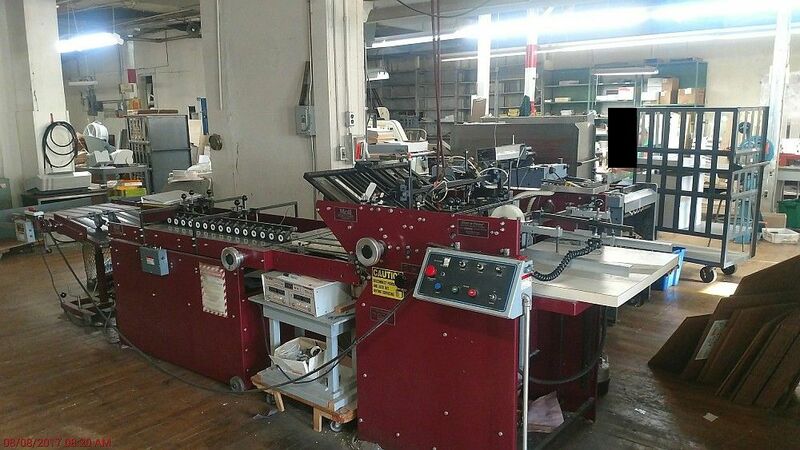 Hand feed, Final-Fold, Dial-a-Stack 24x48 conveyor, cold glue system. 2005 James Burn Lhermite EX380 [#89579] [image] $Call. With conveyor and Martin Yale model 400 jogger, transformer.